My current Facebook profile photo has changed; I now have a face painted with native designs. 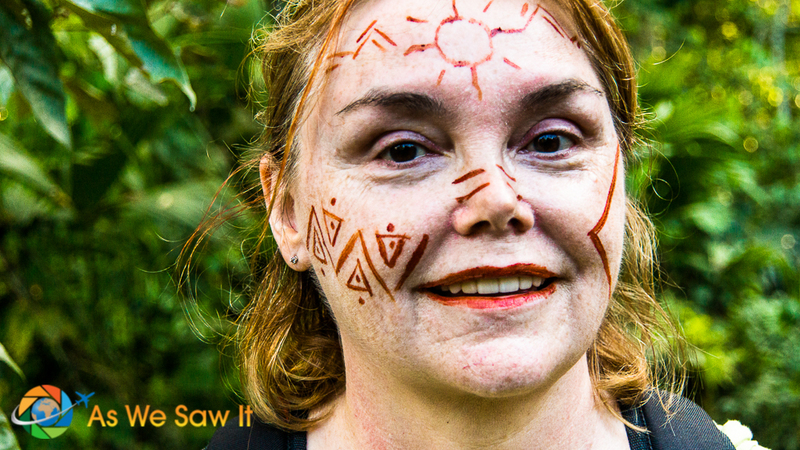 Dan took it while we were visiting an Amazon tribe called the Kichwa, and I wrote about my Kichwa face painting experience last week. If you have ever visited Ecuador, Peru or Colombia you may have heard of Quechua. Or Kichwa. Either way you spell it, it refers to both an indigenous people and a group of native languages. And then there's Quichua, which just adds to the confusion. It's the to-may-to/to-mah-to dilemma. One people, spelled multiple ways. Of the over 5 million results from googling Kichwa, the top two are Kichwa language and Quechua people. At least, that's how Almighty Google spells it. Quichua comes up in the results too. So never mind. To add to the confusion, regardless of what Google says, the language is spelled Quechua in Cuenca. Me? I spell it the way the tribe had spelled it on their sign. I figure they would know. Tip: If you hear people speaking an unusual, non-Spanish language in Cuenca, it's probably Quechua. The Kichwa community gets a lot of its income from community-based tourism, sharing their skills and traditions with visitors who seek to experience a way of life different from what they know at home. They continue to speak their own language, prepare and share their traditional foods and chicha drink, use the same medicinal plants their grandparents used, and their children still respect their elders. Their ancient traditions are alive and well, and our recent Amazon trip gave us the opportunity to appreciate them. 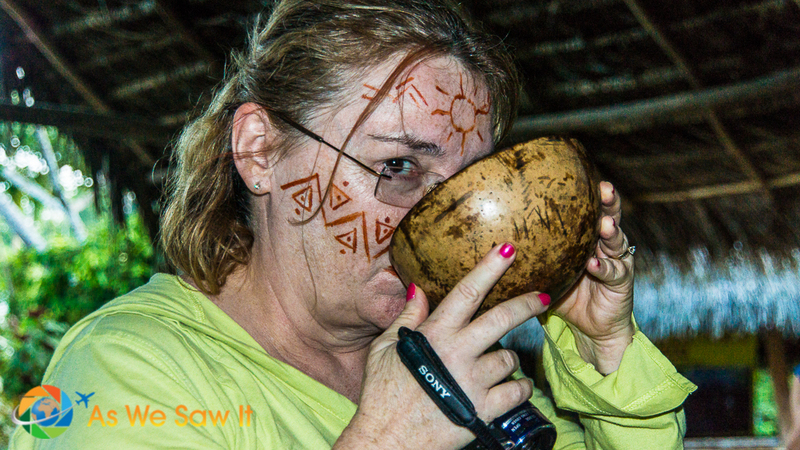 We visited the Kichwa while we were staying at Cotococha Lodge on the Napo River. River travel is the preferred way to get around in the Amazon, so we got there by boat. As we traveled we saw people panning for gold along the shore. 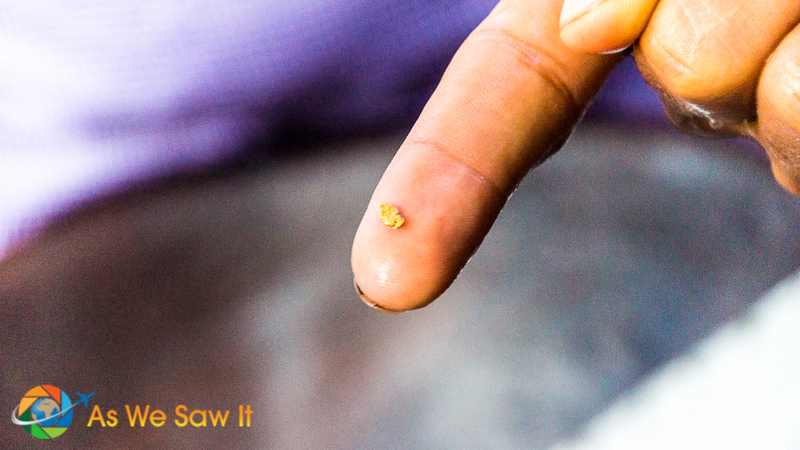 The gold washes down from high in the Andes, where the Incas once lived, and everyone in the area knows about it. 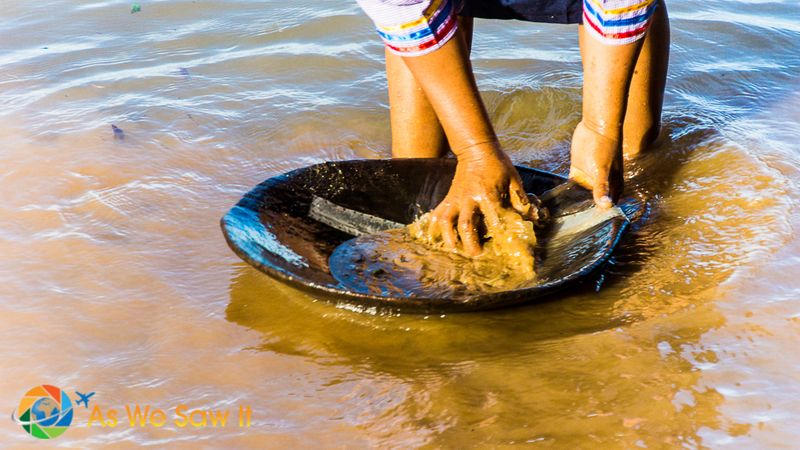 It's common for locals to spend days or weeks panning for gold, then as soon as they get enough, they will sell it and take a few months off living off the proceeds. Once they run out of money, they'll return to the rivers' shores with their pans, and do it all over again. I don't know if that's how the Kichwa do things, though. Our Kichwa community tour began even before our boat landed, as we saw a Kichwa panning in the river while awaiting our arrival. As we disembarked our guide introduced us to Mariana, standing on the shoreline's rocks with her pan. They may call it a pan, but it really looks like a very shallow wooden bowl. I’m guessing they need huge trees to make them, too, because the ones they use every day are larger than the one she was using during her demonstration. Many people don't know that the Andes is full of gold. Whenever there’s a big storm up in the Andes, the natives know an income is not far behind. As rainwater drains into the Amazon basin, it carries soil along with it. The river rises, then recedes, leaving behind 10-20 centimeters of new sediment along its banks. The Kichwa know there's gold in them there pebbles, and they are determined to find it. 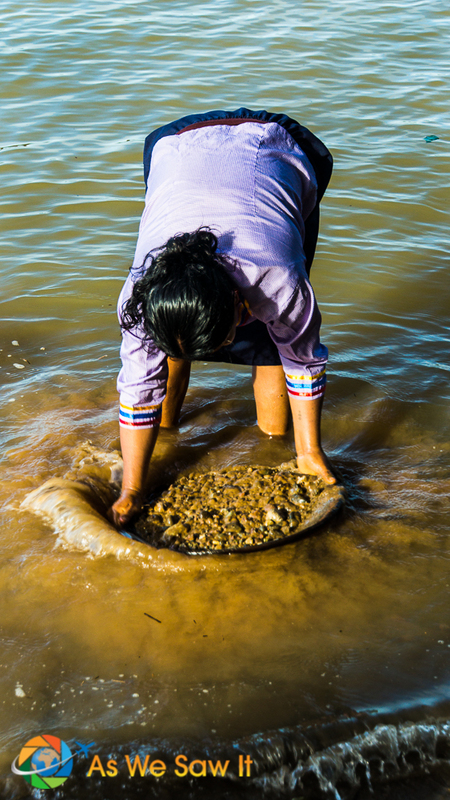 Standing barefoot in the river, they drop handfuls of the river sand into special pans. They then gently swirl the dirt to get rid of the silt and wash off the rocks. As the larger pebbles rise to the top, they sweep them out of the pan again and again. They continue to swirl and sweep until all the large pieces are gone and only a little bit of fine sediment remains in the bottom of the pan. Finally, they swirl the sediment again and again, looking for anything that might look like gold. 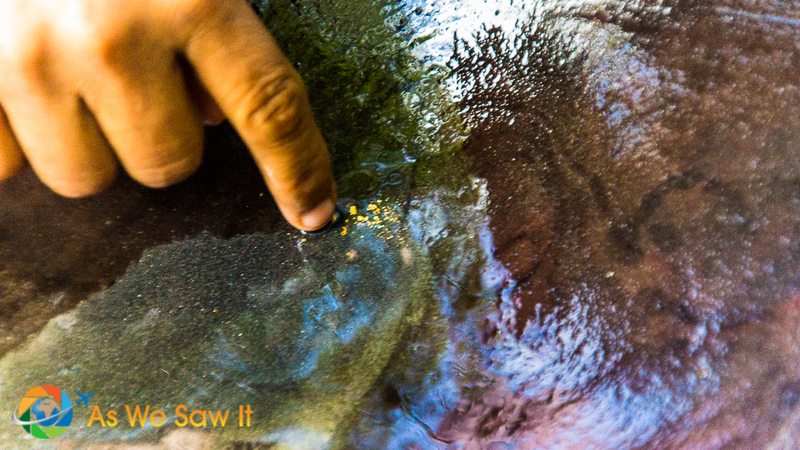 The gold that washes down from the mountain is lightweight of course, just minuscule flecks. It can be very easy to miss if you don’t know what you’re looking for. After watching her demonstration, we headed into the community center so we could learn more about their culture. Our guide taught us how to blow a dart gun, drink some of the famed chicha, and explained more about their culture. Chicha is traditionally prepared by women. They wash, peel and chew cassava (yuca) root, then spit the juice into a bowl. After storing it for four days, it will be ready for drinking, but it will be a low alcohol version – only 1% alcohol. They wait 10 days for the strong stuff. We tried the mild version. It tasted a lot like yeasty water, no particular flavor, and not sweet at all. Here is some more information to help you plan your own trip. We have a few articles about what to do in Ecuador's Amazon basin. I know you guys lived in Ecuador for a while so you probably know better than I do, but I was told by some indigenous people there that Kichwa (the language of certain indigenous tribes living in Ecuador prior to the Incan invasion) is actually completely different from Quechua (the language of the Incas), and they don’t understand Quechua (as it’s spoken in Peru today). In any case, gold panning sounds like really hard work! I’m not sure I could do it for a living! Interesting thread. I am from Saskatchewan. I bought a gold pan and went out to the North Saskatchewan river some years ago and had no luck. I know there is only flour gold and it is somewhat minuscule however i thought it would be fun finding some. I had no luck at all. Glad to hear someone else has had success.